The big and extreme hairstyles of the 80s were brought back and reinvented for the Summer and Fall of 2009 along with miniskirts, leggings and neon fabrics. Teased hair came back into fashion along with crimped strands, hairline poufs and pompadours. Versions of those vintage hairstyles and looks have been combined with great short hair styles and softened for 2011. 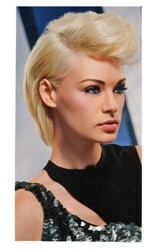 They offer such versatility to short hair styles that you can bet they will definitely continue to be strong for 2012. One hairstyle which is popular for short hair styles is the hairline pompadour. When it first caught fire in the 80s the front-end head fluff was favored by men. 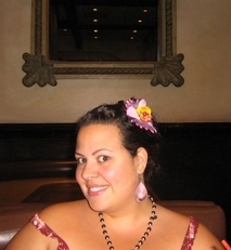 In 2009 thanks to Snooki and fashion trends, women started to rock the hairline pompadour as well. For 2011-2012 the pompadour has been pumped up for short hairstyles creating an instant edginess on hair which might fall flat without a focus. Daya Vivian Vaidya (born May 20, 1973 in Kathmandu, Nepal) is a American actress known for her role as Nina Inara as a series regular in the TV series Unforgettable which stars Poppy Montgomery as Carrie Well. Besides her work on the popular CBS series, Daya is known for her raven black hair which she wearing in a short hair style with layers. She usually wears her short hair with a long side-swept fringe which provides softness to her square shaped face and helps to bring out her eyes and lips. Daya’s fringe flows from a high side part with lots of volume built into the the sides and top. The ends are lightly textured and they form soft flicks of movement. 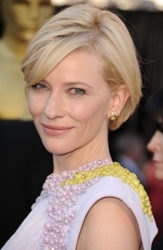 Her short hair style has precision cut layers which add beautiful movement to the overall look. The always adorable Ginnifer Goodwin, 32, was on NBC’s Today Show on Saturday chatting about her new film “Something Borrowed” with Kate Hudson. The actress showcased her iconic short choppy hairstyle which combines a hard edge around the perimeter and a soft fluffy heavily layered exterior. Ginnifer’s dark brunette tresses are highlighted with small ribbons of soft caramel. The top of her short choppy crop extends from a deep side part and is brushed over to one side creating lots of lush volume which lays in lots of layers over a side-swept fringe. Although Ginnifer admits to wearing wigs for her acting roles, her short chop keeps getting shorter and choppier.